Mata Gurjri ji: W ife of Guru Teg Bahadur, mother of Guru Gobind Singh Sahib Ji. 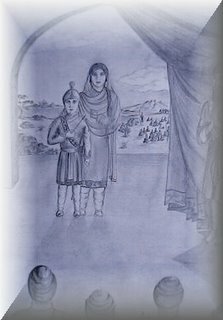 Guru Gobind Rai assumed the Guruship at the age of 9. During those early years of his life, his father, Guru Teg Bahadur, decided to make an extensive tour of the eastern parts of India, his purpose was to preach the Sikh faith among the people there. The responsibility for training Gobind Rai was left in the hands of his mother, Mata Gujri Ji. What kind of woman must she have been to be chosen by God to teach and guide Gobind Rai so that he would be capable of assuming the Guruship? He was a human boy, but he had the most divine mother who instructed him in the ways of wisdom so thoroughly that he was ready to take on the responsibility for his destiny when he was nine years old. "...God works through a woman's touch. Man is what woman creates him to be..."
Gobind Rai was what he was, but the destiny of his soul was entrusted to Mata Gujri Ji's care it was the touch of his mother through which God could awaken him. And didn't the Gurus teach us - those who are truly married are one soul in two bodies? If this is Divine Truth, can we possibly say that Mata Gujri Ji and Guru Teg Bahadur were one soul in two bodies? If marriage creates us as one soul in two bodies - then what is the difference between Guru Teg Bahadur and Mata Gujri Ji except that they had two different jobs to do, two different times and spaces, yet sharing one light between them? She was the woman who created the man who created the Khalsa. And so powerful was her touch that Gobind Rai was ready to lead when he was a nine years old boy. The Panj Piare: The names of the Panj Piare are inscribed in the heart of every Khalsa. Bhai Daya Singh, Bhai Dharam Singh, Bhai Mohkam Singh, Bhai Himmat Singh, and Bhai Sahib Singh. Their act of total surrender and devotion, of being willing to give their heads to the Guru, is celebrated every year at Baisakhi. It was through their selfless courage, absolute love, and total fearlessness that the Khalsa came to life. But do we know the names of their mothers and what their mothers did to raise them with such a consciousness? Everyone has the Light of the Divine within them. That is never the question. But to live that Light unto death - that is a matter of training and the mother is the first training ground of the soul. What values did their mothers instil in them? What discipline? What stories? How did their mothers teach them? What did they teach them? Wouldn't it be wonderful if we had a parenting book for Sikhs based on how these mothers raised these boys? The boys who became the Panj Piare and initiated the order of the Khalsa? Truly, they must have had Khalsa women as mothers, even though the Khalsa had not yet come to life. When the day comes for the Khalsa nation to truly rise in its glory, greatness and spiritual sovereignty, it will be Khalsa women who lead the way. Women who have crowned themselves as Princesses of Guru Gobind Singh and live in the nobility, dignity and grace of the 10th Master. Women who, with their loving touch, transform their homes into the Ghrist Ashram where meditation and practice of the Guru's teachings are the center of family life. Where all who need solace, healing and comfort are welcomed with open arms, warm food and kindness. 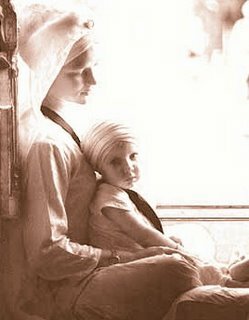 Women who can train their sons and daughters in meditation and Gurbani so that their children do not become confused by doubt and maya, but have such a clear, direct experience of the Divine that they can fearlessly live to the calling of their Spirit and Destiny, even unto death. For the Khalsa nation to come to life, those who have the destiny to give birth to it must realize their duty. And every Sikh has an obligation to do everything possible to give those Khalsa women a chance to wake up, own their power and change the world. I love this blog; it's about my all-time favourite blog. I do have one problem with it, I hope you don't mind my saying. Your light grey letters on the white background look very elegant, but for those of us who have little eyesight left, it is very hard to read. Can you please offer a suggestion or something how I can darken the letters? Thank you very much. Firstly, thank you so much for your supporting this blog. I apoligize for the light colour (grey) that is on some of the blog posts. The thing is, when I changed my blog template, all of previous blog posts changed colours. I am trying to change all of them back to black, however I know I have missed some in the process. I will do this as soon as possible. I think the grey is hard on everyones eyes! But thank you for reminding me! If you do come across more grey posts, I would suggest to highlight the paragraph with the mouse because then the paragraph turns blue!